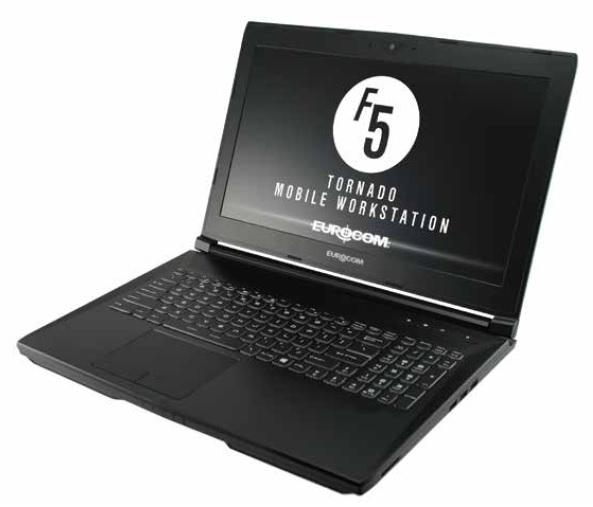 Eurocom has launched the Tornado F5 Mobile Workstation powered by Intel Xeon E5 1200 V5 series processors, up to 64 GB of DDR4 memory, up to 8 TB RAIDable storage and MXM 3.0b NVIDIA Quadro graphics options up to M5000M for the ultimate tool for on the go professionals. Utilizing the Intel C236 chipset and LGA 1151 socket allows the EUROCOM Tornado F5 Workstation to support professional grade Intel Xeon E3 1200 v5 processors that offer versatility across diverse workloads and are supercharged for efficiency, performance and rock solid reliability. They support workloads for cloud, high performance computing, networking and storage. The EUROCOM Tornado F5 Workstation offers a complete range of graphics cards from NVIDIA Quadro M1000M, M3000M, M4000M and M5000M, through an MXM 3.0b slot, to give our customers the exact professional graphics performance level for their needs. Eurocom offers the NVIDIA Quadro mobile product family because it offers a complete range of graphics options with unmatched performance and quality for the most demanding professional users on the go. “We are ecstatic to offer our highly demanding, professional customers another professional grade product like the Tornado F5 Workstation so our fans have the tools to do their job brilliantly. The 15.6” aluminum alloy, heavy duty chassis is fully upgradeable and configurable allowing customers to choose the exact components they need and to extend the lifespan of their machine with upgrades and repairs if needed.” Mark Bialic, Eurocom President. Two M.2 SSD PCIe x2/x4 or SATA SSD and one 9.5mm SATA3 6Gb/s storage drive is also supported to offer a great combination of up to 8 TB capacity and blazing speed. Four memory slots are available to support up to 64 GB of DDR4 SODIMM. Customers have a 15.6” FHD matte display and a 4K matte display to choose from as well. The EUROCOM Tornado F5 Workstation is driven by a complete line of optional 4 core and 8 thread Intel Xeon E3 V5 processors, based on the LGA 1151 processor socket and C236 chipset. Up to 64GB of superfast DDR4-3000 SODIMM memory is also supported via four memory slots. Solid State drives with RAID capability are supported in the Tornado. Support for up to 8 terabytes of storage and RAID 0,1 capability gives users the ultimate in performance or redundancy. Two M.2 SSD PCIe x2/x4 or SATA SSD and one 9.5mm SATA3 6Gb/s storage drive is also supported to offer a great combination of capacity and speed. Equipped with an 8cells; 14.4V 5225mAh/75.24Wh lithium-ion swappable battery pack, which offers upwards of 1.5 hours or backup power in case of electricity failure, which allows for safe and secure shutdown after power loss. External 230 W or 330W AC Adapter / power supplies are available.